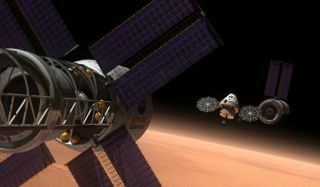 NEW YORK — Russia is ready and willing to partner with the United States for a manned mission to Mars, a senior Russian space official said recently. And while NASA has not yet entered into any formal agreement to pursue the Red Planet, the agency's chief agrees that international cooperation is the way to do it. "I have to say that currently there is no country that could organize a manned spaceflight to Mars and a safe return," Sergey Saveliev, the deputy head of Russian Space Agency (Roscosmos), said April 12 at the United Nations headquarters here to mark theInternational Day of Human Space Flight. "We strongly believe that this project can be accomplished only through international cooperation," Saveliev said through a translator. "In this field, Russia is ready to cooperate with the United States, with Europe and with other countries." NASA chief Charles Bolden, who was also on hand at the event, agreed that collaboration is the way to go. "We are absolutely trying to partner with everybody to go — anyone who wants to participate," Bolden told SPACE.com. "Our goal is to try to form international coalitions. Almost everything we do today has some international flavor to it, whether it's science flights, or human spaceflights. I think you'll find everything we do from here on out is probably going to be international in nature." "In order to accomplish this mission, we have to develop new technologies, first of all, new propulsion technologies, as well as technologies to counter existing harms of spaceflight, like radiation," Saveliev said. NASA has no firm time frame to send humans to Mars, but the agency is starting up work on a huge new heavy-lift rocket that could travel there. The vehicle, called the Space Launch System (SLS), is designed to go beyond low-Earth orbit to the moon, asteroids and eventually Mars — all destinations beyond the reach of NASA's space shuttles, which retired last year. The agency is aiming for a first flight of the Space Launch System in 2017.
International collaboration is already a strong feature of many nations' space programs, as going it alone can be prohibitively costly. The United States and Russia are currently partnering with Japan, Canada and the European Space Agency on the International Space Station, a weightless laboratory that cost $100 billion to build. Bolden emphasized NASA's commitment to future collaboration as well. "Since NASA was founded 52 years ago, international cooperation has been one of our cornerstones," Bolden said during his remarks. "We have entered into about 4,000 agreements in that time, with more than 120 nations and touching almost every aspect of NASA's activities. Right now, NASA has 535 active international agreements. This cooperation is the definition of win-win, bringing multiple benefits to everyone involved."